Vortex © 1980 Zilec Games. 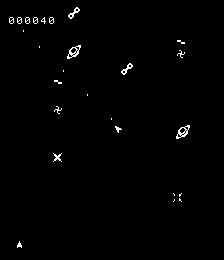 An Asteroids style game. You control a spaceship of the space Federation, lost in the deep space in the middle of a interstellar Vortex, use your expertise You can rotate 360 degrees, shoot missiles, thrust forward in any direction, and your mision is to survive attacking all differents objects as, stars, vortex, planets ,space Junk, alien ships and avoid and destroy all remains, before the spaceship is destroyed in the collision. to go to next stage! Sound Chips : Discrete circuitry.